Yalda, the longest night of the year has been celebrated in Persia and modern day Iran for centuries. It signifies the victory of good (light) over evil (darkness). 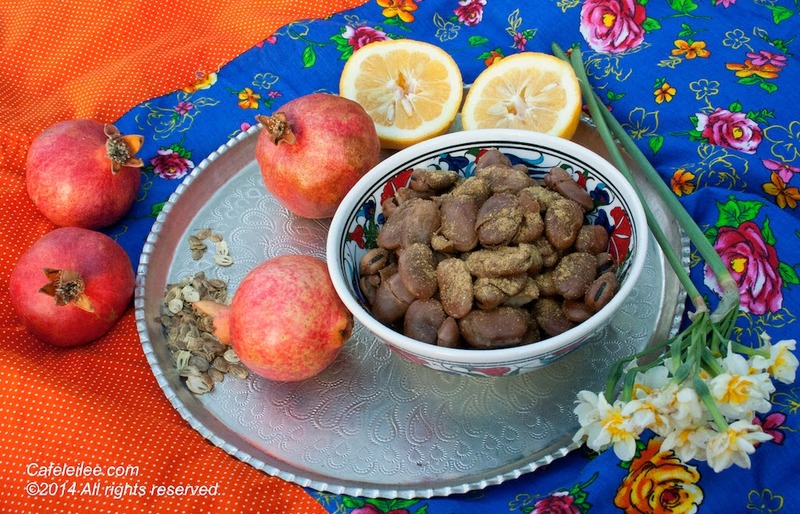 To celebrate, Iranians all over the world will get together with friends and family after dark on the last day of autumn to read poetry, snack on pomegranate seeds, watermelon, nuts and dried fruits. Traditionally, some people would lit candles and stay up until sunrise to witness the victory of light over darkness, have a hearty breakfast and leave the party. However in the modern days since Yalda doesn't always fall on a weekend and most people are busy with the day to day activity the celebration usually lasts until later in the night. As a child, I remember Yalda being one of my favorite times of the year. We would get together with cousins, aunts and uncles. We would laugh at jokes, be mesmerized by old tales told by our elders, and read our fortunes from Hafez (14th century Iranian poet who wrote about joys of love and wine). In our family there has been an additional food next to the cut watermelon, nuts, and bowls of pomegranate seeds that my dad had been seeding that day. We love to snack on cooked fava beans. 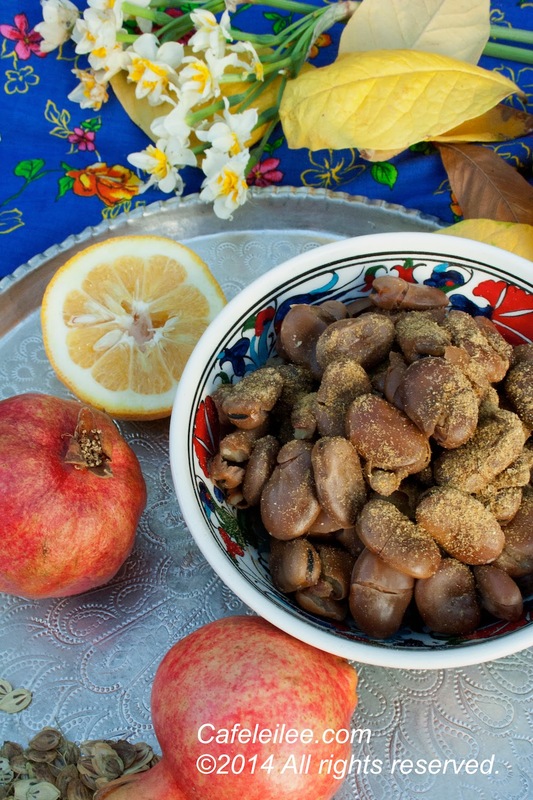 Cooked fava beans are a favorite winter snack in Iran, whether they are cooked at home or sold by street vendors in corners of the streets, drizzled with juice of seville orange or vinegar and sprinkled with some angelica powder they are both comforting and fun to eat. To cook them, bring to a boil 1 pound fresh fava beans in a pot with 8 cups of water and 4 tablespoons salt, then reduce the heat to simmer and cook for about 15 minutes. Alternatively, if you are using frozen fava beans you can cook them for about 5 minutes. And If you are using dried ones, you need to cook them for about 3 hours. After the beans are fully cooked, drain them and drizzle them with the juice of seville oranges or vinegar and sprinkle them with angelica powder, salt and pepper to taste. Noosh-e-jaan and have a happy Yalda! Oh yes, cooked fava beans are wonderful and brings back lots of nostalgic memories. Beautiful story of Yalda and beautiful photos. Happy Shabe Yalda! Fae. What a nice thing to remember! Hot fava beans and golpar. It really is a great snack. Cooked fava beans are a usual snack in our house around this time of the year, thanks for the lovely post. Happy Yalda! Thanks so much for sharing your memories and this awesome snack. Baghali pokhteh is always a hit and yours looks delicious! Leilee jan, somehow I wrote a comment and it got lost :( But I love your recipe - I had always heard of this from my parents but never tried it. I'll definitely be preparing this as I love fava beans! Merci, xoxo.